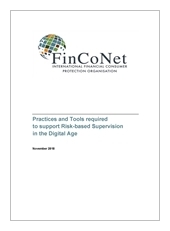 ‌ This report analyses supervisory reaction to the digitalisation phenomenon. While there is a broad concern about the nature and size of the challenge, the supervisory approaches towards digital transformation of those who responded to the survey are at different stages of development. In most cases, authorities focus predominantly on adapting traditional supervisory tools to DFPS, while the creation of new specific tools is frequently still in the early stages. 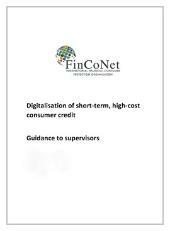 This Guidance was developed to support and assist supervisors to effectively address the main drivers of financial consumer protection risks relating to the provision of short-term high-cost consumer credit through digital channels and it is based on the main findings of FinCoNet’s 2017 report Digitalisation of short-term, high-cost consumer credit and the good practice observations described in FinCoNet’s 2014 Report on Responsible Lending. This Guidance consists of eight main topics, each of which is supported by specific supervisory actions that may be implemented by supervisors.